Fall is fast approaching, and that means apple-picking. But if you want to get a head start – just get yourself some Eclos Anti-Aging Skincare from the drugstore! 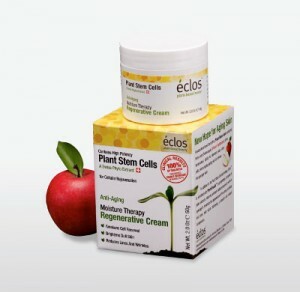 Eclos skincare contains stem cells from a very special apple; new research shows that the stem cells that are extracted from a particular apple – the Swiss Uttwiler Spatlauber – can dramatically reduce the appearance of lines and wrinkles. In clinical studies, the apple stem cells were found to reduce wrinkles and wrinkle depth in 100% — that’s right, 100% — of study participants in as little as two weeks of twice-daily application. That means that Eclos, and an apple stem cell a day, really can help keep wrinkles away. These Swiss apples are extraordinary. Whereas other apple varieties become soft and wrinkled, say, after four months of being picked, the Uttwiler Spatlauber remains fresh. In addition, when the bark of this particular apple tree is damaged, or when the unpicked fruit is punctured, it heals itself. So just imagine what it can do for your skin! Eclos Anti-Aging Skincare Products also contain a special ingredient called PhytoPlex24, a proprietary mix of plant extracts, antioxidants and vitamins to work with the apple stem cells to minimize the appearance of fine lines, tired skin and wrinkles. They are also made without parabens, sulfates, synthetic fragrances or dyes, and without petro-chemicals. They also smell gorgeous. All of the products include natural oils of rosewood, ylang ylang, palmarose, cardamom and geranium. Using them at home will make you feel like you’re at the chicest spa, getting the most luxurious of treatments. Standouts in the Eclos line include the Facial Cleanser Skin Prep, which glides on, works into a soft, creamy lather and leaves your skin vibrant. I use mine with my Clarisonic, to achieve superb skincare results, to make my skin squeaky clean. The Instant Radiance Face Scrub also offers you a spa-like result, but available at mass-market prices! The Eclos Cellular Activator Face Serum contains two powerful peptides that promote collagen production. Slather it on for superb results. In fact, I even use it on my hands, to also counteract aging and fine lines. I like having fantastic-looking fingers, don’t you? The Eclos Regenerative Cream brightens dull skin, as it contains green tea, turmeric, Ginkgo Biloba, chamomile and cucumber. As I beauty writer, I’m just planting the (apple) seed here – but Eclos will encourage your skin to behave like younger skin, delivering a smooth and radiant complexion. As a Boston beauty writer who always advises my readers how to travel and stay healthy and beautiful, get this — there’s even a $19.99 starter kit of small sizes. Stash these great Eclos products in your Samsonite when you travel, and send wrinkles packing!